The idea of earning “airmiles” with a certain credit card is certainly not a new one, these kinds of rewards have been around for a long time now (relatively speaking that is, the first credit cards did not even debut until the mid 1950s). Many credit card issuers have taken the air miles concept to the next level and beyond though and nowadays there are so many different travel rewards credit cards it is very hard to know how to even begin to compare them all and choose the one that is best for you. The fact that many of these credit cards have offers and promotions that are ever-changing, as well as a lot of fine print to wade through, makes the task even harder. Here though is a little information about some of the best credit cards for travel rewards, cards that offer more “bang for your buck” without charging you too much more for the privilege of earning travel rewards. In addition to those who have always been “road warriors” taking business trips that are just far enough away from home to warrant an overnight stay but not far enough to fly as companies try to cut their budgets wherever they can an increasing number of business travelers are finding that their companies prefer that they drive to their destination rather than fly if it makes better financial sense so for these travelers an air-miles credit may not be of very much use to them. They do however still need a place to stay, which is where a card like the Chase Marriott Rewards Visa comes in handy. The same holds true for vacationers who decide to avoid the hassles of air travel and take to the road instead. The Chase Marriott Rewards Visa is, as its name suggests, a joint offering from Chase and hotel giants The Marriott Company. All purchases made on the card earn one reward point for every one dollar spent but when the card is used to pay for accommodations at one over the more 3,000 Marriott destinations worldwide that goes up to 3 points for every dollar spent. The array of travel rewards that these points can be redeemed is very impressive. In addition to being able to earn the almost inevitable free nights stays at Marriott properties points can be redeemed for special vacation packages, including golf packages including a trip to the (Nick) Faldo Golf Academy, skydiving packages, surfing adventures and many other ‘experience” trips. Rewards earned with the Chase Marriott Rewards card do not have to be spent on travel related items though. Card holders can choose to redeem them for a number of consumers items (electronics, housewares etc.) retail gift certificates or even to convert their rewards points into cash donations to a number of different charities. The card does come with a $30 annual fee attached to it, but that fee is waived for the first year and comes with a relatively attractive 14.24% variable APR associated with it. For those who travel internationally, either for business or pleasure and do so to Europe or Asia British Airways is one of the most popular airline choices. The Chase British Airways Visa Signature card is a traditional air miles card – rewards are earned strictly as miles not points, but for the fairly frequent flier they do accumulate rather quickly. Cardholders earn 1.25 miles for every dollar spent on anything on the card and 2.5 miles on travel on British Airways flights and certain other partner airlines which include American Airlines, Quantas, Cathay Pacific and Japan Airlines. Miles can also be redeemed for travel on any of those airlines as well. In addition to earning miles on everyday purchases once a card holder has spent a total of $30,000 on their card account (which can be spread across one or more cards if an additional card holder is added to the account) they are rewarded with a companion flight certificate which does not expire for 2 years from the date of issue. There is a $95 annual fee charged to Chase British Airways Visa Signature card holders and the APR is charged at a variable rate of 14.25%. What if you are a traveler with no particular loyalty to a certain airline or hotel chain though? Then the American Express Blue Sky card, which charges no annual fee, might be a very good choice. 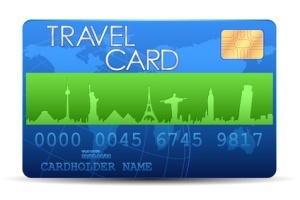 Although card holders only earn points at the same one-point-per-dollar rate across the board rather than earning extra points on certain purchase categories as is the case with many other travel reward cards the American Express Blue Sky card gives cardholders $100 off eligible travel purchases and other reward options (gift certificates, electronics etc.) for every 7,500 points. In other words for every $75 worth of rewards earned cardholders actually receive $100. If you are willing to pay a $75 annual fee you can choose to upgrade to the premium version of this travel rewards credit card , the American Express Blue Sky Preferred card. This version of the card earns cardholders 2 points per dollar spent and awards cardholders with an automatic $100 a year credit that can be spent on airline costs like checked baggage fees or in flight meal upgrade charges.